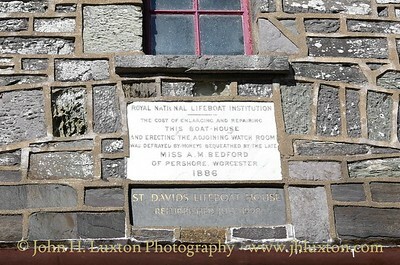 RNLI St Davids (based in St Justinian, near St Davids, Pembrokeshire, Wales) opened in 1869. 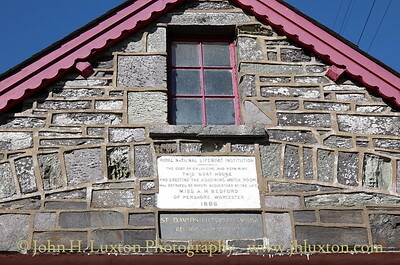 At present there are three stations the original station rebuilt in the early 1900s, the current station and the new larger station construction of which commenced in summer 2014 with official opening taking place in March 2017. 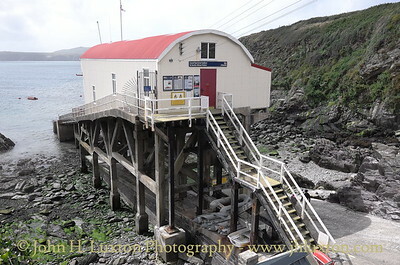 The new station accommodates a Tamar Class boat RNLB NORA WORTLEY. 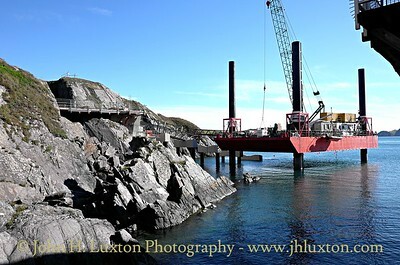 The new station was constructed by BAM Nuttall at a cost of £9.5m. 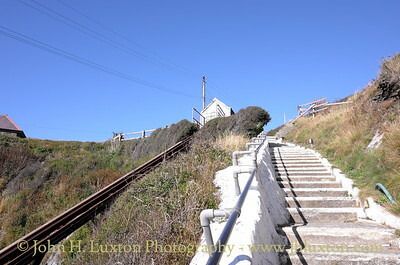 It is linked to the cliff top by both steps and a single car funicular railway which unlike that provided for the original stations is designed to carry passengers. 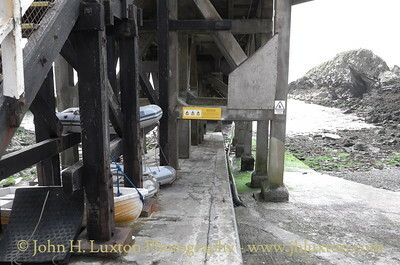 Part of the slipway of the original station is used as a landing point for the Ramsey Island ferries. 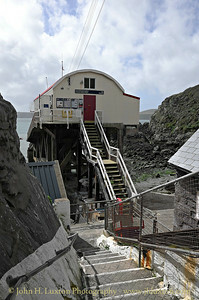 The only access to the current and original stations is via a steep flight or steps, however, a small cable operated funicular railway is available to raise and lower equipment. 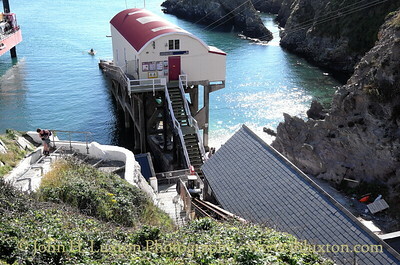 View down the funicular railway to the lifeboat station. The three stations, original, current and new can be seen in this view. Of the original station only the roof is visible. 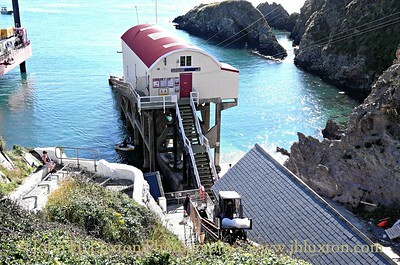 The funicular railway can be seen on the left. 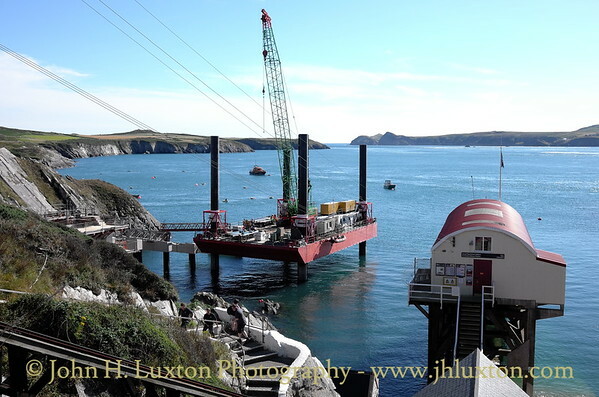 The new Tamar class lifeboat RNLB NORAH WORTLEY can be seen at anchor beyond the jack up rig. 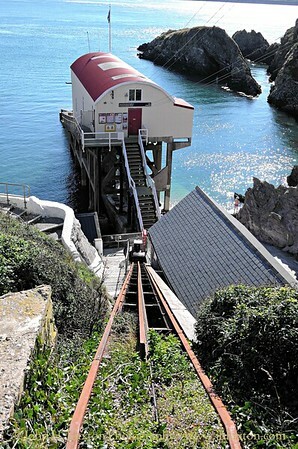 The funicular railway wagon has been loaded and is just about to start to ascend. The wagon is now half way up. 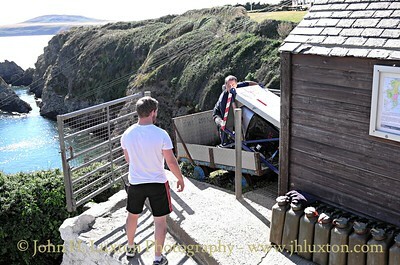 Unloading the funicular railway wagon appears to lifted a container with an outboard motor. Note the fuel cans. View to Ramsey Island the Ramsey Island ferry departs from here. 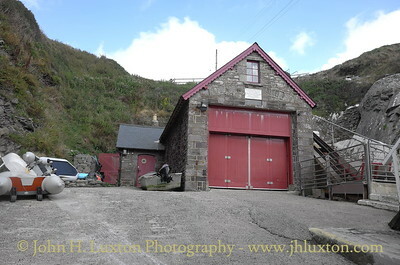 The original lifeboat station. 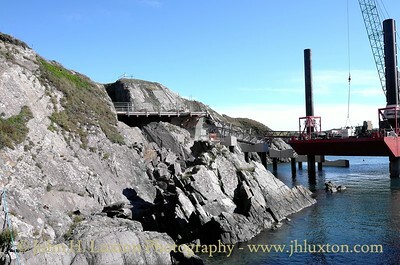 The bottom of the funicular railway can be seen on the right. 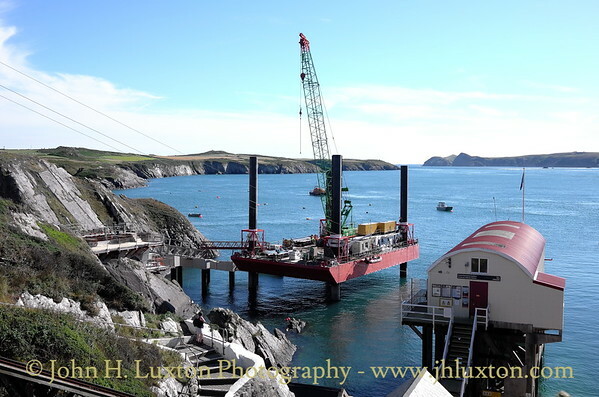 The new £9.5m St Davids Lifeboat Station under construction by BAM Nuttall. 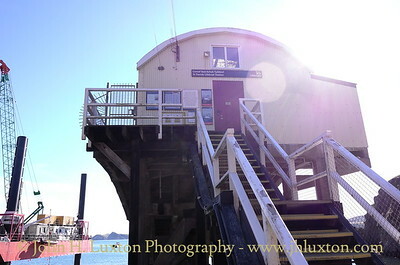 The current station - sun in the wrong place! 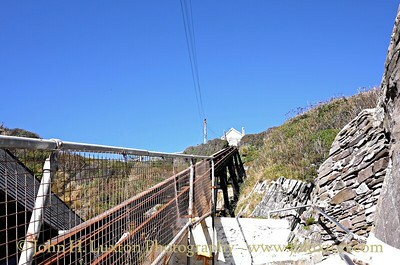 View up the funicular railway track. The centre rail appears to be used to hold the truck onto the track and prevent derailments. View up the steps from the station. 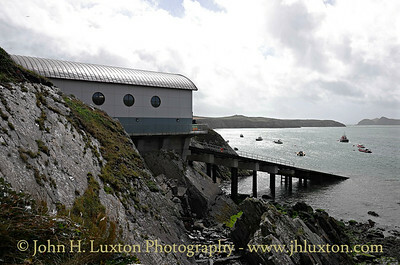 The second lifeboat station at St David's. 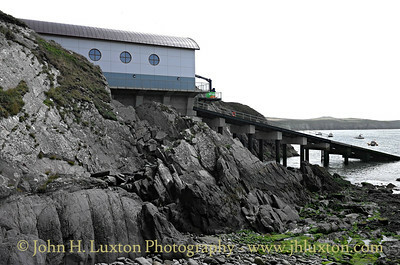 The new St David's Lifeboat Station seen nearing completion - compare these photographs with others in this gallery taken 53 weeks earlier. 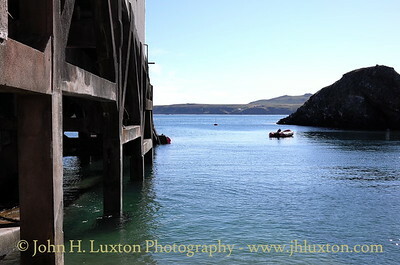 The Second lifeboat station at St. Davids was constructed above the original slipway. 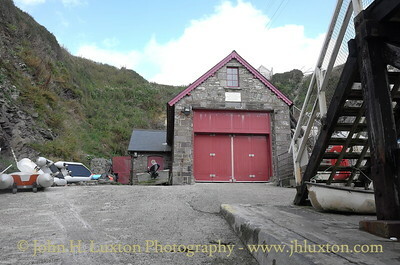 The slipway is now used as a departure point for the Ramsey Island passenger ferry. 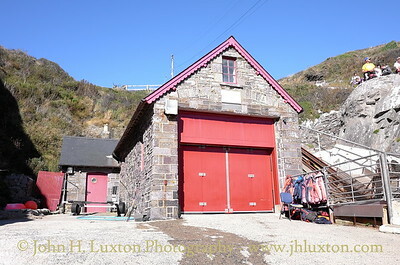 The original lifeboat station at St Davids which is now used as a boat store.